At what height above Earth is zero-gravity? Part of the show What causes Brain Freeze? At what height does zero gravity take effect? Would this vary from different parts of the Earth, and if so, why would this be the case? David - I think there might be a misconception here that, as you get further and further away from the Earth, you’re feeling less of a gravitational pull and at some point you stop feeling the pull of the Earth’s gravity. That’s not what happens! If you double your distance from the centre of the Earth, the gravity would decrease to a quarter of what it is at the surface, but that’s not zero G.
Zero G in space is because you’re in a space capsule accelerating under gravity, orbiting the Earth, or going from one body to another and you’re not accelerating [relative to the spacecraft]: the person within the spaceship is accelerating at the same rate as the vessel. So it’s like the lift dropping down the lift shaft. So zero G is not distance away from the Earth. Chris - So people who are on the International Space Station, the reason that they are in orbit around the Earth is because gravity is hanging onto them and keeping them in orbit? But they’re just free-falling around the Earth all the time so that they’re weightless, but that’s not the same as zero G? David - Correct. They’re in freefall. They’re still experiencing the Earth’s gravity but so is the spaceship that they’re in. So, between them and the space ship, there’s no acceleration. Chris - Let’s take it to it’s logical conclusion; the reason that Pluto is 6 billion kilometres from where we are here on Earth and it’s still orbiting the Sun is because the Sun’s gravity is hanging onto Pluto, even though it’s that far away. And gravity does get weaker with distance, but there’s still enough to hold onto Pluto and things beyond it. Previous How many photons does it take to see an object? Next Are men with more facial hair more fertile? Agree, the question wasn't answered. 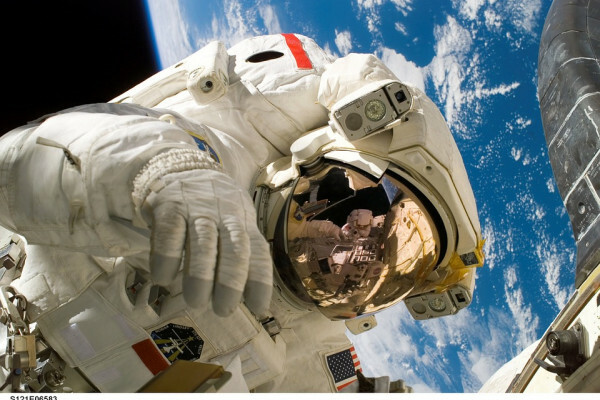 How far from earth do you have to be before the effect of earth's gravity is negligible? (Eg a human would not notice it while doing everyday human things.) Forget spaceships. What do you call negligible? Gravity obeys an inverse square law - 1/r^2 - so if you double the distance from the centre of mass, the gravity you feel at the new location is 1/(2^2) = 1/4 of what you felt at the first location. But it's not zero. The question says "At what height above Earth is zero-gravity?" The answer, as given - is at no height is there zero gravity, because although, at vast distances, 1/r^2 means that the gravitatonal acceleration will be very low, it's not zero. The question isn't answered. I would assume the amount of gravitational attraction would depend on the mass of each object. Therefore the smaller the object the less distance it would take to escape the gravitational attraction of the earth. So what would that distance be for the Space Shuttle for example? The size of different objects would determine how much things are atracted to them but not how much they are atracted to other things. This is why you can drop a feather and a bowling ball on the moon and they hit the surface at the same time. Truly feathers have always had the speed to fall as fast as anything else but unlike larger denser objects such as bowling balls,feathers do not have the mass and therefore the momentum to push through the air which is why they fall so slow on earth. So whether it be a space shuttle or an astronaut or a peanut, they'll all feel the same amount of gravity at any given distance. You are correct that a feather and a bowling ball dropped on the moon will hit the ground at the same time. Both are being accelerated by gravity, but the gravitational pull between the bowling ball and the moon is greater than the moon and the feather; but the ball's mass is significantly greater than the feather; so the greater force of attraction is negated by the greater mass; hence both fall at the same rate. Yes feather and bowling ball fall at the same rate because the acceleration of gravity is the same for both the bowling ball and there is no air resistance going against the feather on the moon. Same case on earth in a vaccum, acceleration of gravity is 9.8 m/s^2 hence both objects fall at the same speed because they are on earth with no air resistance or friction. BUT you are correct the bigger the mass the more it is likely to be attracted to another even bigger mass. So the further the ball goes away from earth the gravitational force weakens but not as much as the feather. Which has nothing to do with how fast an object falls on a planet or moon .